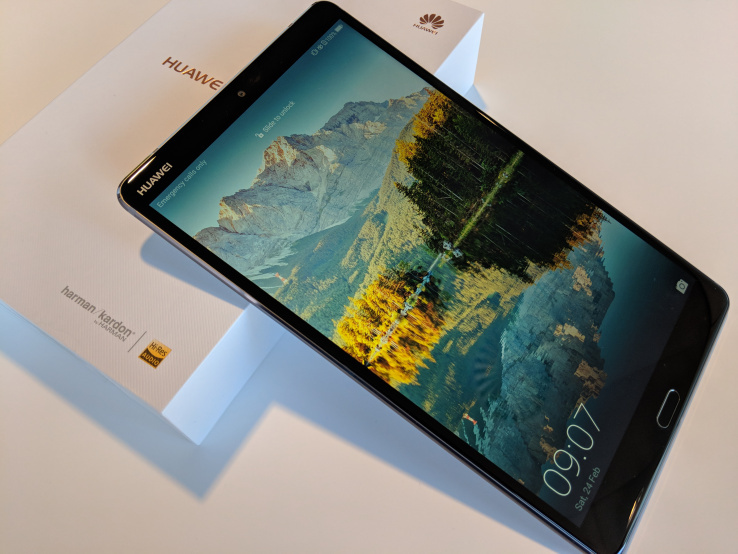 Tablets may not be the most exciting product category these days, but they also aren’t quite as dead as some pundits would like you to believe — and for Huawei, they are actually a growing business. Indeed, the company argues that it’s now the third largest tablet maker in the world. It’s no surprise then that the company today unveiled two (or three, depending on how you want to count) new tablets under its MediaPad brand at its annual Mobile World Congress press conference in Barcelona. Unlike Huawei’s new MateBook laptops, which feature a rather odd camera that’s built into the keyboard, we’re talking about some pretty standard tablets here. The new MediaPad M5 tablets will come in two sizes: 8.4 and 10.8 inches, starting at 349 and 399 Euros respectively. For the most part, the smaller and larger tablets have exactly the same specs, with 2560×1600 displays (for a 359 and 280 PPI rating, respectively), Kirin 960 quad-core processors, 4GB of RAM and either 32, 64 or 128 GB of storage space. They also come with pretty standard 8MP front cameras and 13MP rear cameras, all the usual sensors (including a fingerprint sensor) and Android 8.0. All of the SKUs also offer an SD card expansion slot that can bring the total on-board storage up to 256 GB. There is a third version, too, the 10.8-inch MediaPad M5 Pro, which features the exact same specs as the regular 10.8-inch M5, but with added support for Huawei’s M-Pen. As the company stressed during a briefing ahead of the event, the pen features 4096 levels of pressure sensitivity and support for tilting and shading. The Pro will also support a detachable keyboard and offer a desktop view with expanded file management features. All versions of the tablet are available in, as Huawei notes, “two iconic colors: Space Gray and Mystic Silver.” LTE support is an option on all versions, too. We had a bit of time with all of the tablets ahead of today’s announcement. It’s hard to get excited about tablets these days, but the M5’s look like perfectly solid choices if you’re in the market for an Android tablet, with both the build quality and screens being the stand-out attributes here.